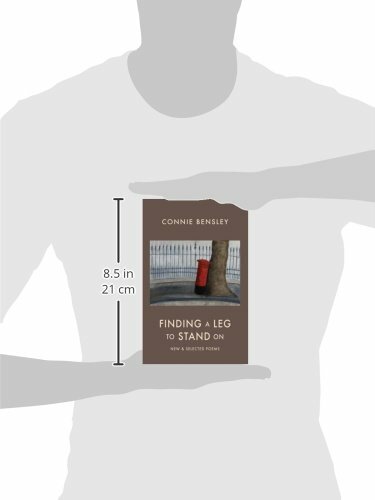 Knowing, precise and often cheerfully acerbic, Connie Bensley’s poems revel in poking gentle fun at the self-deceptions and delusions of middle-class suburban life. 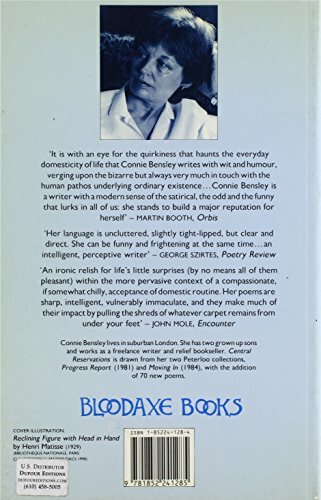 Whether she brings her lapidary and resolutely unadorned words to bear on our misplaced hopes and fears, the cruelties of age, or, as ‘Apologia’ has it, the poet’s own ‘too dull and too careful’ life, Bensley manages to be both witty and unsparing, warm and cool-headed, in poetry that questions the blurred lines between the serious and the comic, as well as the personal and the public. 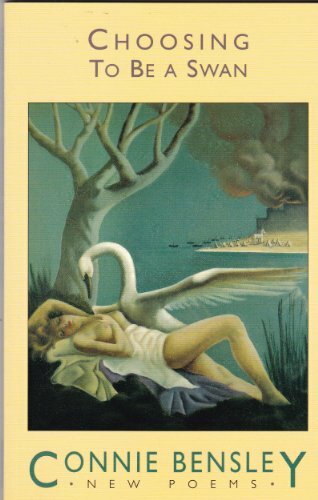 It is this mixture of characterful wit and social realism that has doubtless led to her work being compared with that of playwrights such as Alan Ayckbourn and Alan Bennett. But if she calls to mind any poet in particular, it is Hugo Williams. Both write poems that are piercingly inquiring, of themselves and of others, while also looking to disarm life’s pain – making it bearable by a kind of gallows humour, in that quintessentially English manner. As one critic has remarked, Bensley’s great strength is ‘her unpretentiousness, her self-mockery, her refusal to be portentous’. 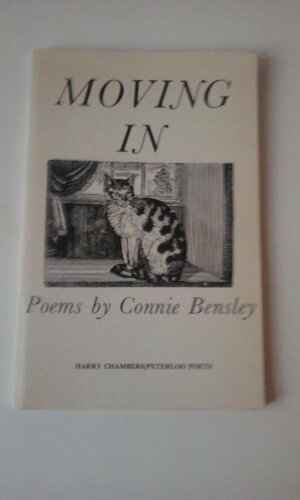 Connie Bensley was born in 1929, in south-west London, where she still lives. 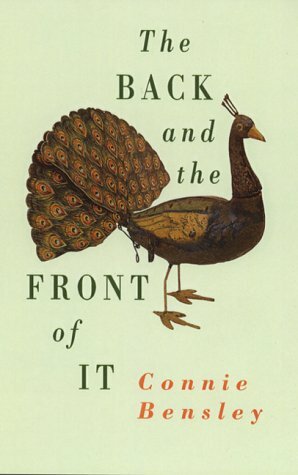 Perhaps unsurprisingly for a poet who made a career as a secretary and copywriter, her poems are often marked by a notable fastidiousness, whether in their commitment to metre and rhyme, or in the subtle accuracies of their descriptive observations. Included in this Archive recording (which draws primarily on Finding a Leg to Stand On: New & Selected Poems (2012), a compendium of the best of Bensley’s six volumes of verse) is ‘Bloomsbury Snapshot’, a condensed character study of the literary set; ‘Piccadilly in the Sunshine’, which tellingly finds ‘the roadsweeping machine’ that ‘weaves between dark-suited men’; and ‘Getting it Right’, an anecdotal snapshot in which the speaker, shivering in a bus queue, watches a commercial being made across the road, where ‘a girl in jeans comes out of a shop’ before she is ‘sent back // again and again’. When the bus arrives, the speaker and her fellow passengers board, but ‘with more care / than usual’. ‘Are we doing it with conviction?’, asks the poet: ‘Are we getting it right?’ Throughout Bensley’s deceptively everyday poetry, the stark suggestion that life is what happens, with no time for retakes or dress rehearsals, is never far away. Despite their brevity, her focused lyric poems are as adept at appraising our desires and apparent needs (‘I need to go shopping for mascara. / He needs to get to the pub before closing time. […] // She needs water. A cupful could save her’), as they are at unpicking the ulterior motives and unspoken thoughts and feelings that can govern our actions, as in ‘A Friendship’, included in the online selection from this Archive recording. Delivering her poems in a quietly assured and conversational manner, Bensley’s voice confirms what Express on Sunday has called her ‘not only funny but truthful’ writing. It may ‘view the world from London SW13’, but it also knows that ‘hope, betrayal, love, self-delusion and moments of happiness characterise life lived in the suburbs just as much as anywhere else’. Connie Bensley’s recording was made on 6th May 2015 at The Soundhouse, London and was produced by Anne Rosenfeld. "The poetic impulse ... is more like a desire to separate a piece of one’s experience and set it up on its own; ... in the absence of this impulse, nothing stirs." - Philip Larkin, Letters to Monica. "If I belong anywhere, it is among a school of poets about which surprisingly few doctoral theses have been written: The Back of the Envelope School. They are capable of producing poetry only on a surreptitious basis..." - Dennis O’Driscoll, Troubled Thoughts, Majestic Dreams. "The first time I heard the phrase 'poetry workshop' I remember thinking of the carpentry room at school... Did you have to go somewhere special to do it? Was there a retail outlet?" - Hugo Williams, Freelance, TLS.